A travel guide to places you might not want to travel to! Irresistible to both traveller and armchair travellers some of the places are familiar - Krakatoa, the Chateau at Montsegur & Amityville. However others were completely new to me. The graveyard of Russian nuclear submarines, Cape York's killer crocs and the impact on the environment of visitors to the Maldives. An interesting read. 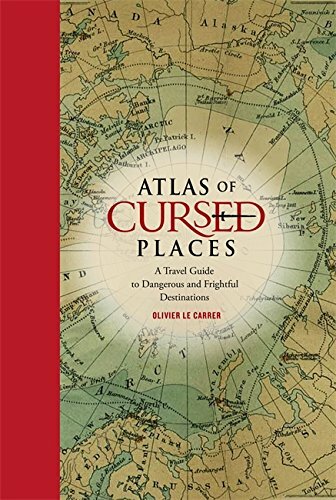 I just loved the idea of a travel guide to “cursed places”. In this Atlas of Cursed Places by Olivier Le Carrer the contents section of the book made me even more keen to read it. I think that most people will be like me and know they want to read it or simply pass by. For those who do want to read it there is a treat in store. It is beautifully presented with maps and plans, longitude and latitude for each cursed place. The write up then indicates why the author considers the location a “cursed place”. I guess any such book is subjective and others may not agree that some places are cursed and will wonder at others that are not included. I found covering Nuremberg and yet none of the “death camps” a little strange for example. The places covered in this book vary from those about which there are ancient legends through to really quite contemporary areas; indeed in the case of the “graveyard” of Russia’s nuclear submarines you could argue that the curse has not quite been fulfilled yet. The range of places covered and the reasons are wide and varied. The basic outline of some of the places I was familiar with; Krakatoa, the Chateau at Montsegur & Amityville would would be examples, However others were completely new to me. The graveyard of Russian nuclear submarines, Cape York’s killer crocs and the impact on the environment of visitors to the Maldives I knew less or nothing about; it won’t make them holiday destinations for me however I did find it very interesting. There are actually places I’d like to visit as a result of this book and certainly some I’d like to know more about. If I have a criticism about this book it would be that the articles on each place are fairly short; the feel was more like magazine articles than chapters maybe. While I really appreciated the maps that accompanied each place it would have been nice to have some photographs although I realise not every place lends itself to a picture – photographs of the Bermuda Triangle would probably be less than interesting. However it is still a book I enjoyed.